This post may contain affiliate links, meaning, at no cost to you, I will receive a small commission if you make a purchase through the link - please see my full disclosure policy here. Spring is pretty much here already even though the weather is still pretty cold (at least where I am)! That means we have some rainy, gloomy and yucky spring showers ahead of us. In the past, I looked unpresentable, sloppy and just bleh on rainy days because one second, it would only be drizzling and the next second, I would be soaking wet. I thought it was impossible to dress for this kind of weather AND stay chic throughout the day. I was in the habit of wearing my most worn out shoes, the ugliest pants, and a baseball cap to hide my disheveled hair. Because of that, I tried to remain at home and out of sight on rainy days if I could. 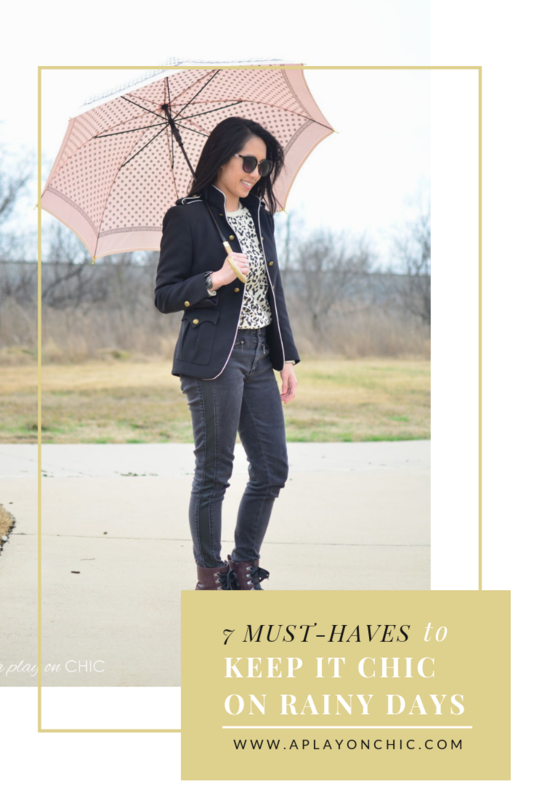 Over time, I have found that there are simple ways to keep it chic and still stay dry in this gray weather… I put together some of my favorite easy rainy day outfit essentials in hopes that it will help all of us get through the spring showers that are soon coming our way. Rain ponchos do not have to be the traditional garbage bag looking-type of rain ponchos. There are so many stylish choices out there. 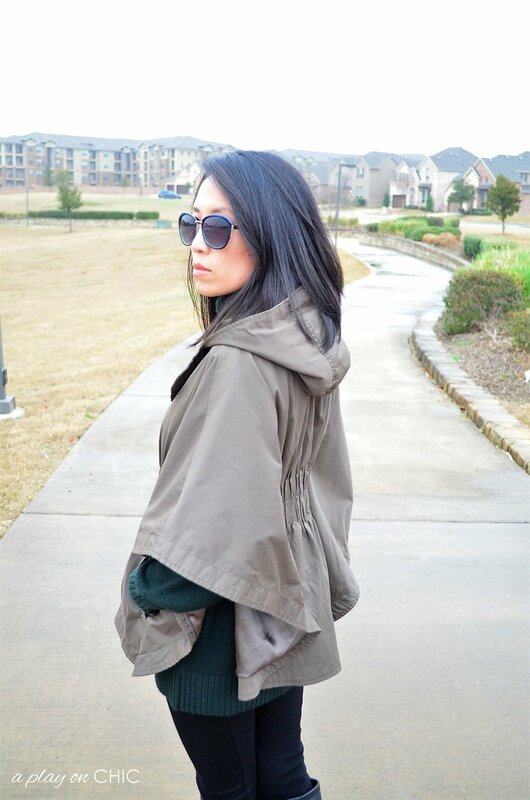 What I love about rain ponchos are that they’re super comfortable, loose enough to protect your clothes, and they’re usually lightweight and waterproof. 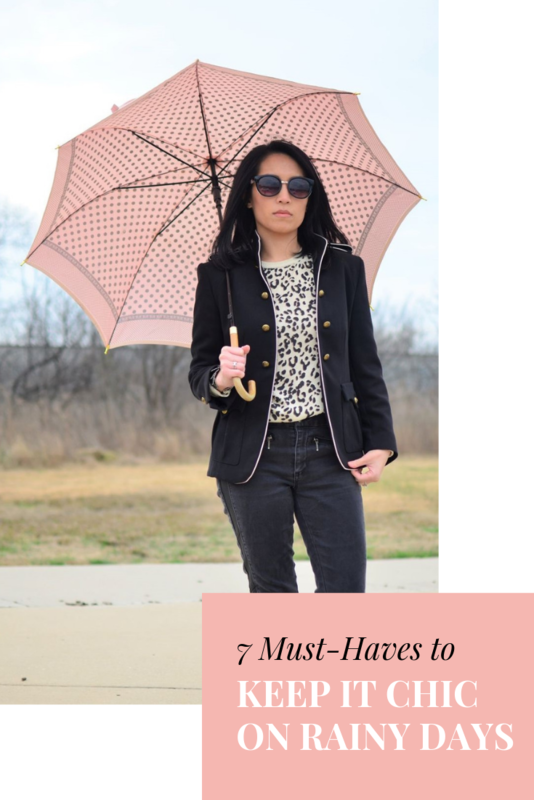 They are perfect for days when it’s drizzling - when the rain is not too heavy to use an umbrella, but still enough drizzle that will frizz up your hair. 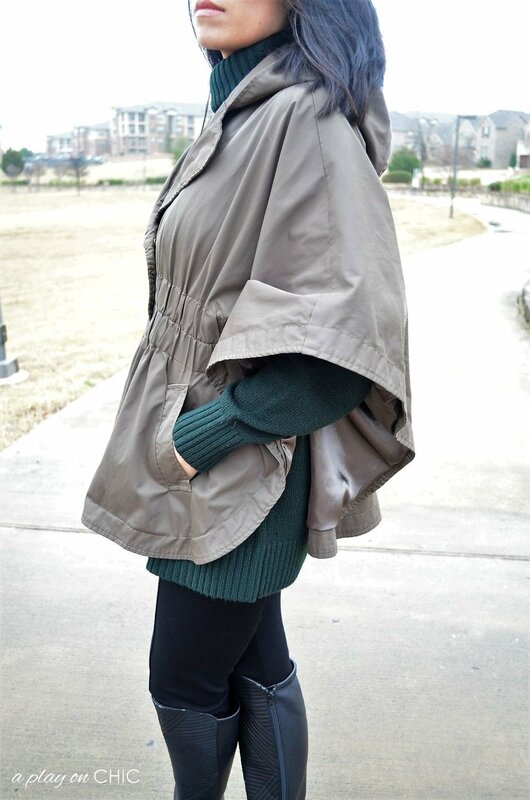 Just cover your hair with the hood of the rain poncho and go about your day. 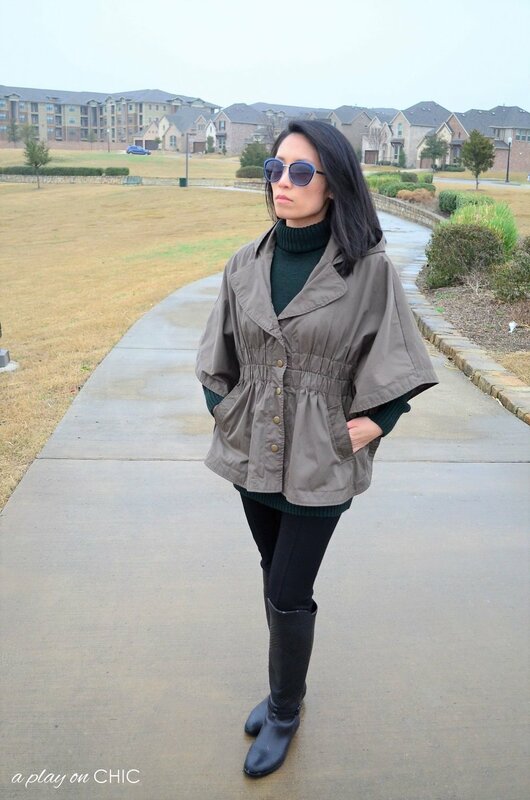 You’ll look super stylish and manage to stay dry under the waterproof fabric of your rain poncho! 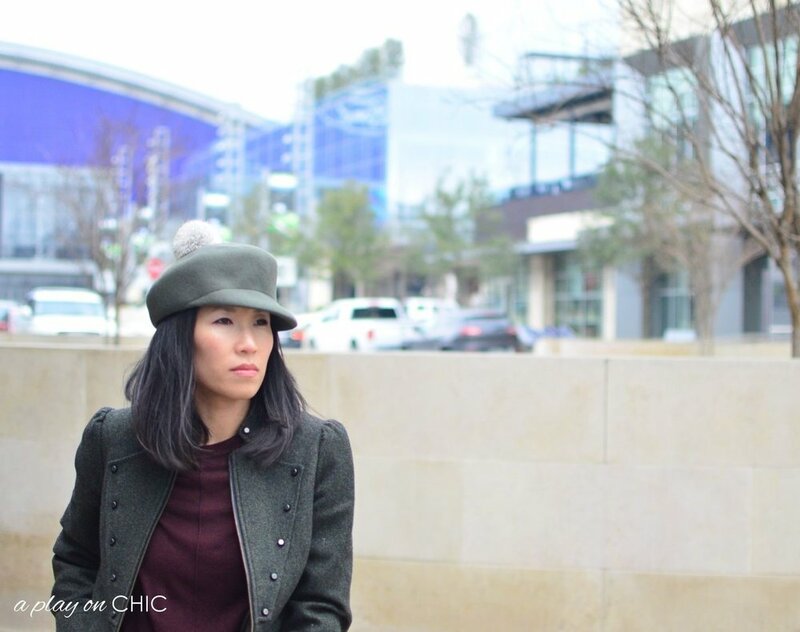 Pairing a stylish coat with a rainy day hat can instantly upgrade your look from ordinary to chic. If your poncho, coat or jacket does not have a hood, then a trendy hat can definitely help with keeping your hair from looking unkempt. There are several styles that I think are appropriate for rainy days ranging from beanies to berets to more structured hats. On rainier days, I still use an umbrella even if I’m wearing a hat, but it helps to keep my hair together and not flying in my face so I don’t miss those mud puddles! Mud puddles on rainy days call for waterproof shoes or boots! Though sneakers are super comfortable and seemingly suitable for rainy weather, I risk ending up with yucky damp socks when I wear them because I always accidentally misjudge how deep those darn invisible puddles of water are. I would suggest investing in some cute rain or waterproof boots that will protect your socks and feet from getting soaked. 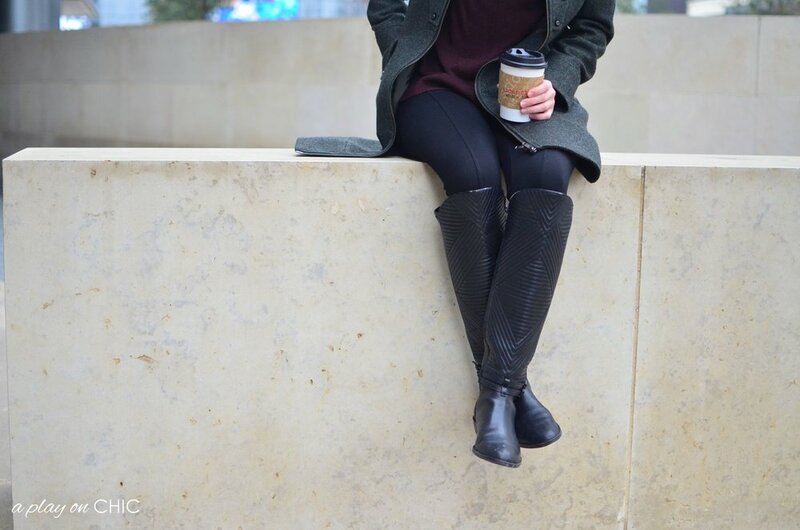 Most of the time, I prefer wearing my black leather boots because they are tried and true waterproof shoes that pair easily with my outfits. 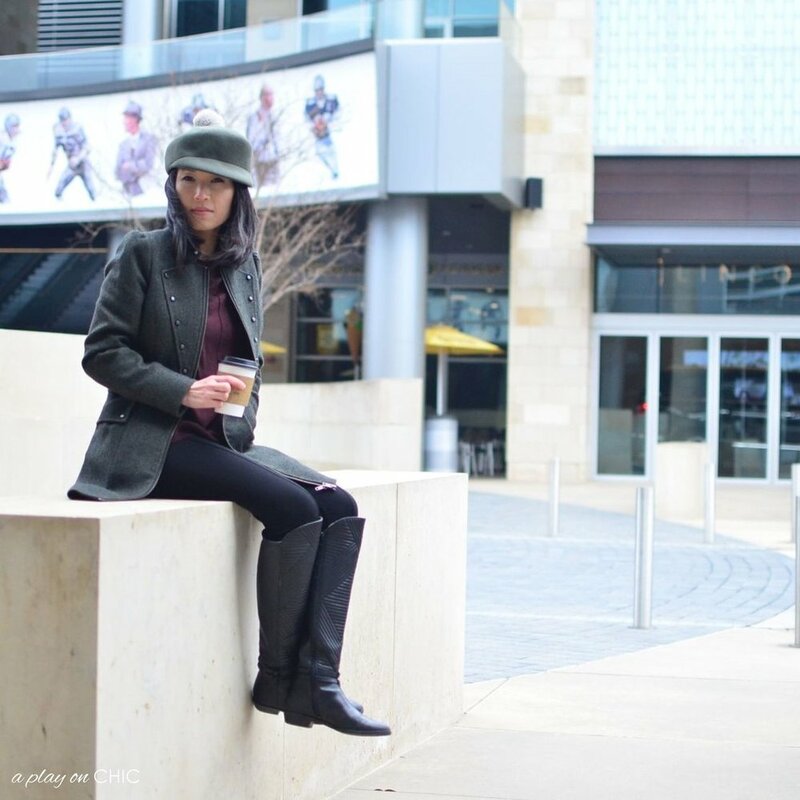 Military style coats with combat boots can chic up your style on rainy days. The structure of the coat helps to upgrade your look from sloppy to sophisticated. 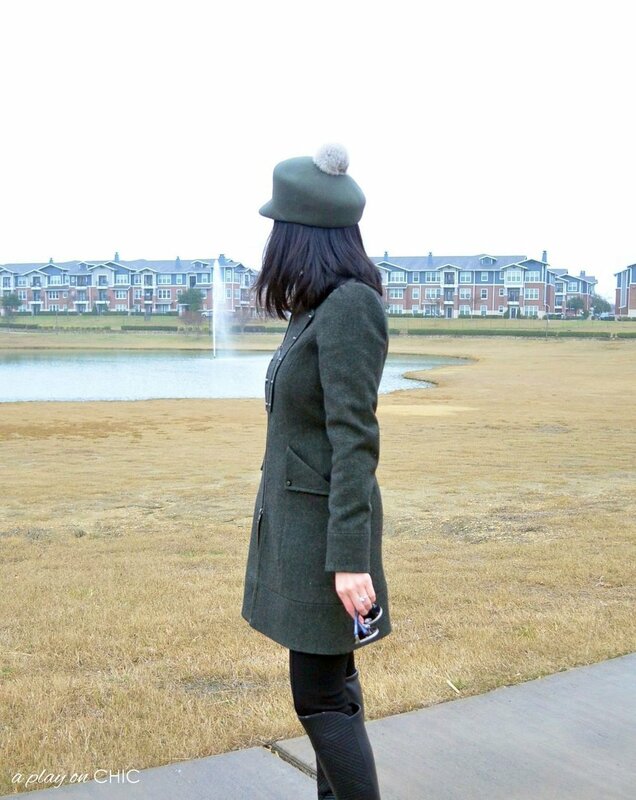 You will quickly see that I love military style coats and jackets. To me, you can be wearing torn up jeans and a t-shirt, but as soon as you throw on a military jacket, it transforms into instant style. There’s something inspiring about mixing feminine attire with something that has historically been associated with more masculine elements. 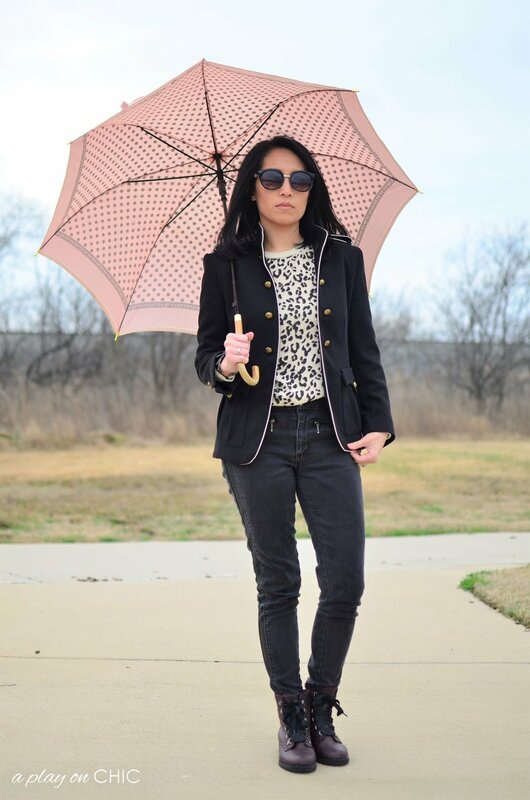 When I think of outfits on rainy days, the first stereotypical image that comes to mind is a khaki colored double-breasted trench coat paired with a black umbrella. 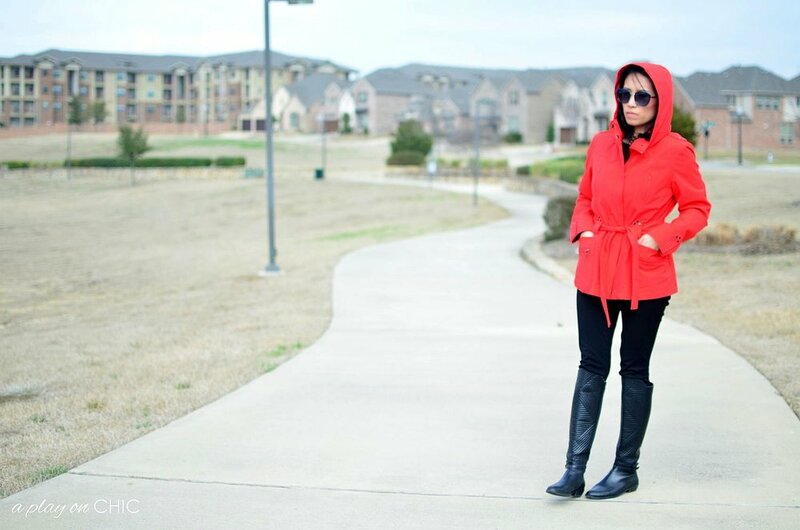 Let’s break that stereotype and upgrade the classic trench coat style! 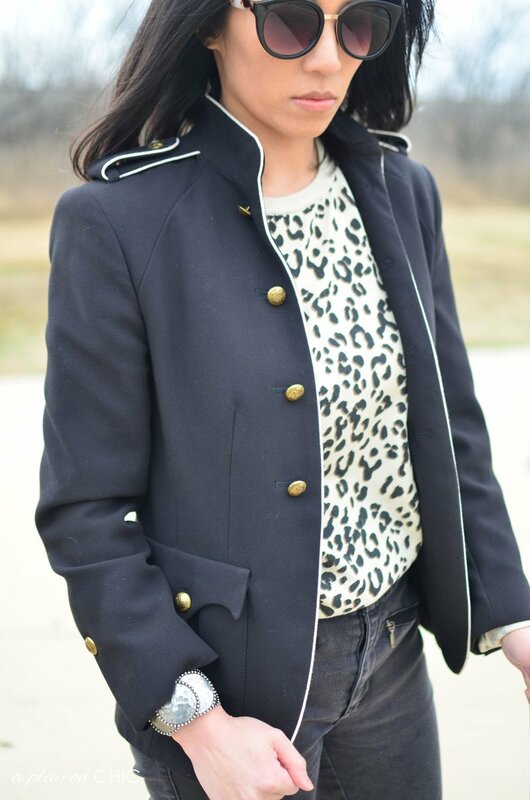 There are several ways to do that: (1) Go for a color that’s different from the normal khaki or black rainy day trench; (2) Try a patterned or plaid trench coat; (3) Experiment with different fabric or textures. Okay, this one sounds obvious. 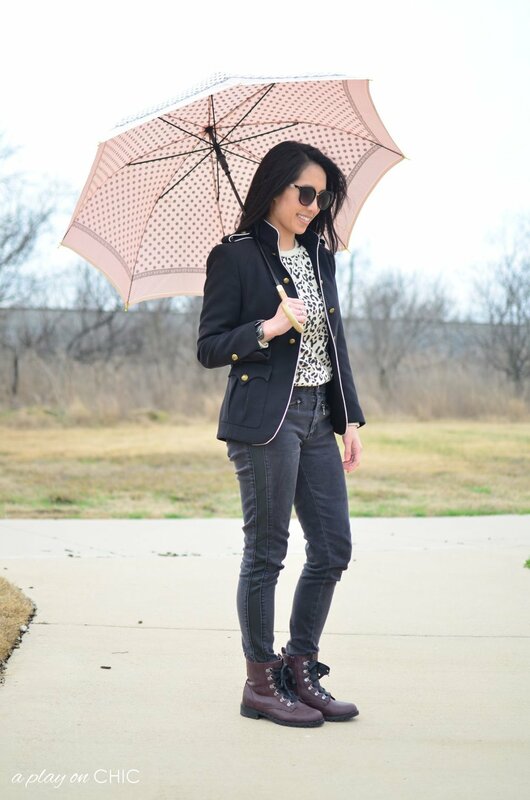 Of course, an umbrella is THE necessity in rainy weather, but that doesn’t mean it has to be boring! May I suggest that we try something different and choose a super colorful and stylish umbrella that is different from…well, your typical black umbrella. Let me show you a few super fun ones below! 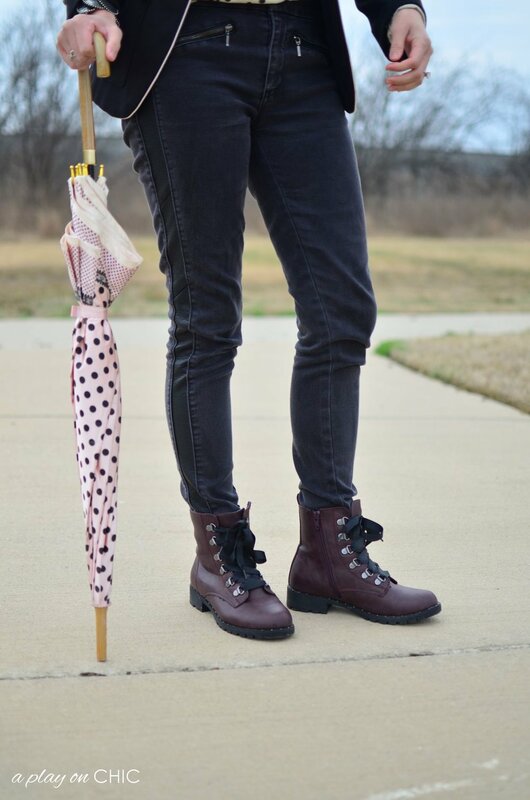 I especially love the clear umbrella with the black polka dots and border! 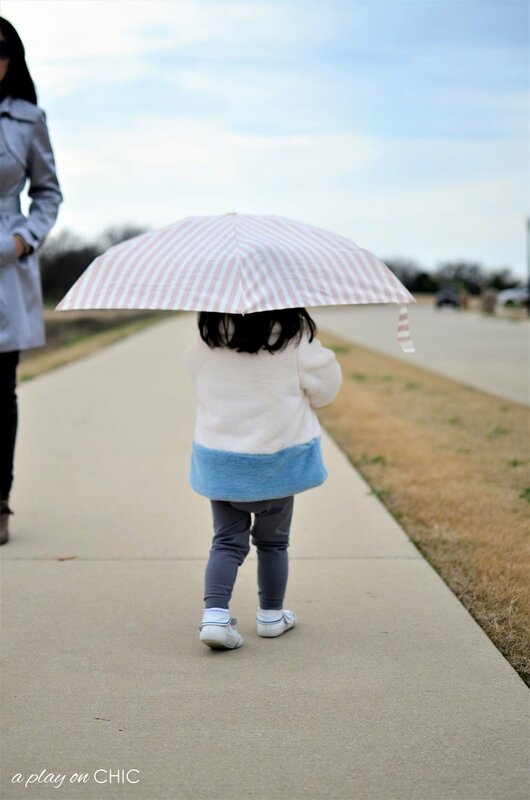 Even my little silly goose has her own stylish pink umbrella! Hope you all enjoyed the post, and as always, thank you for visiting! CHIC Outdoor Furniture in Time for Spring!